Days of Wonder Online – 10 Million Games Celebration! As you have probably noticed the Days of Wonder Online Games Counter on the home page is edging ever closer to reaching the 10,000,000th game played. To celebrate this milestone, we are awarding all the players who participate in the 10 Millionth game with a free copy of every version of Ticket to Ride, plus their choice of any other (currently available) Days of Wonder game. Every registered player or guest is eligible and while it will take a lot of luck, the only thing you need to do to have a chance to win is to play any of your favorite Days of Wonder Online games including any of the Ticket to Ride games, Gang of Four, Fist of Dragonstones or Queen’s Necklace. To be eligible to win, your game can only include “live” players, either registered players or guests (no games with bots will count) and your game must be completed. We’ll contact the lucky winners via email after the 10 Millionth game is completed. Note: Because of the high volume of online games played and the varying speeds of web page updates, it’s highly unlikely that the online game counter on the home page will exactly reflect the current game being started. So trying to time your game exactly is probably not an effective strategy. Just keep playing and good luck! This entry was posted on Friday, January 4th, 2008 at 16:57 and is filed under Games, News, Websites. You can follow any responses to this entry through the RSS 2.0 feed. Both comments and pings are currently closed. Wo finden ich denn den Spielezähler? 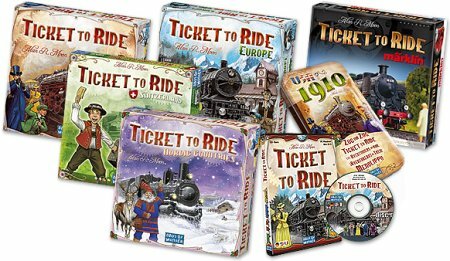 I know that Ticket to Ride Nordic Countries is only available to purchase in those countries. If the participants of the 10 millionth game are NOT from the Nordic Countries, will they still receive Ticket to Ride Nordic Countries? How long has it taken to get to 10,000,000 games? When did the online games go “live”? Our first on-line game, Gang of Four Online, went live on December 2002. But the on-line activity really took off with Ticket to Ride Online, launched in October 2004. Have you considered a Ticket to Ride Japan. They have a phenominal train system there, with both major trunk lines connecting cities and islands, and regional and city lines. I allways enjoy my visits there and using the rail system.